Previous ArticleFlat or house: Reasons why choosing to live in a flat can be a great decision! A yield is the annual revenue or profit expressed as a percentage of a property’s value and it essentially shows how profitable – i.e. how good a buy to let investment – the property is. It’s a relatively quick and easy calculation that allows you to compare properties against each other and against other investments, but the important thing to be aware of is that there are different types of yield. There are also different methods of calculating yields. It doesn’t matter which one you use, as long as you are consistent. This is a useful way of broadly comparing areas for average returns, but it’s not very precise in terms of how profitable a property will actually be for you, personally, because it doesn’t take into account the ongoing costs particular to the property, such as the mortgage and required annual maintenance and, in the case of flats, ground rent and service charges. So the net (pre-tax) yield is a far more useful calculation. 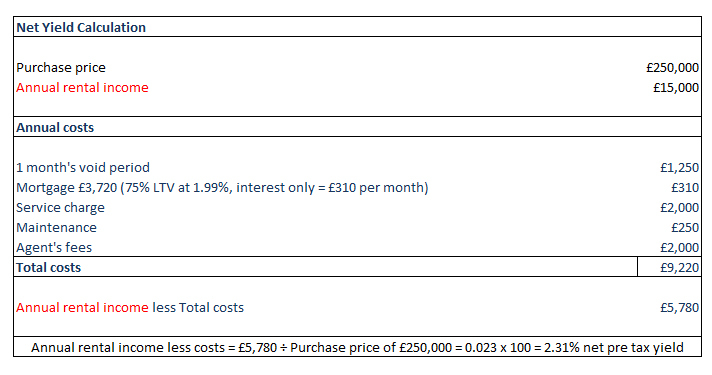 Net Yield: ((annual rental income – annual costs) ÷ (property value)) x 100. 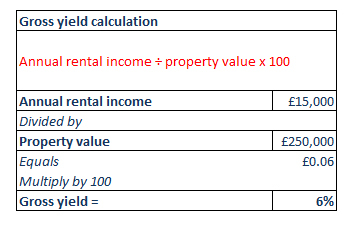 This way of calculating a yield figure is very specific to each property, so it’s primarily most useful for your own financial viability calculations, comparing properties you’re thinking of buying and helping you see whether your rental income is going to be sufficient to (a) cover your costs and (b) generate the return you’re looking for. Because the value of your investment and other properties will rise (or fall) over time, that gross yield calculation is an important one to do every year, when costs change or whenever you’re looking at making a new investment. If you want to calculate your return on capital invested, you can use the same formula, substituting the total amount of capital you’ve invested (deposit plus purchase and refurbishment costs) for the property’s value. Essentially, you can tailor the yield calculation to your requirements, for example, also taking into account the capital growth over a year and adding that to your rental income figure to give a total investment yield. The important thing is that when you’re being quoted a yield figure by a property investment company or looking at one property versus another, you’re clear on exactly how they made their calculation, so that you can do the same at your end and ensure you’re comparing like for like. If you haven’t tackled yield calculations before, you might find the yield calculator on our website useful. If you’ve owned the property for a number of years and haven’t already invested in updates, it’s likely to be well worth doing so. While there is generally an undersupply of rental properties in most areas, and you’re therefore always likely to be able to secure a tenant, if you want to achieve the best possible rent, the fabric of the property, décor and any furnishings really do need to be up to date. In our 2017 tenant survey, respondents cited property condition and cleanliness as by far the most important factor in their choosing a property to rent – even more important than value for money. To make sure improvements don’t impact negatively on your rental income earnings, we can communicate with your tenant because they may happy to have the work done while they’re there. That means you don’t need to wait for the end of one tenancy and suffer a void period while you carry out works before re-letting. We’ll check things such as if your tenant is planning to take any holidays so work can be done while they’re away. They’ll probably be delighted to accommodate you if they’re getting a much-improved home! Obviously, you want to keep your spend in line with what your particular property can achieve in rent – i.e. don’t go fitting marble worktops in the kitchen unless you’re letting to city professionals or at the high end of the market. One of our team will be happy to talk to you about what kind of works would be worthwhile, so do visit your local branch to discuss things before you start to spend money. One of the questions in our tenant survey asked which additional services they would be prepared to pay more for and, if so, how much more. Interestingly, while most landlords shy away from allowing pets in their property, it came out as top in the list of desired perks, with 28% of respondents saying they would be prepared to pay up to £24 a month extra. Behind that, 21% of tenants would pay £19 a month more for high-speed internet. In terms of the most additional rental revenue, tenants said they would pay £36 a month more for a ready-furnished property, £28 a month for cleaning services and £24 for cable/satellite TV and a garden. Taking all the results into account, we found that tenants would pay an average of £20-£25 a month if they were offered extras they saw as beneficial, so look at how much each would cost you and the returns you could subsequently generate over a three to five-year period. For example, if you charge £24 a month for a pet, that’s £288 extra rent a year and it certainly won’t cost you that to clean the property. Remember, you also have the tenant’s deposit, from which you can make deductions for any damage caused by the pet, over and above what could reasonably be expected. If you’re not sure which services it would be worthwhile considering, do come and speak to us. If you have space that’s not currently being used by your tenants, such as a loft or garage, or you have the ability to extend, it’s worth finding out from local property experts whether it might be financially beneficial to invest in expanding the property. Our lettings and sales teams can work together to help you understand what additional rental income you could secure and what uplift in capital value you could realise by converting or extending. In some areas it can make a substantial difference across the board, in others you might see very little increase in the rent you can charge but more than recoup your investment in the increased value. This is the most extreme change you can make and it will require a lot of research and a fair amount of capital injection, but you should be able to more than double the level of rental income. It’s more work to manage an HMO, but you may decide – as many landlords have – that the financial rewards are worth it. Your mortgage and insurance. HMOs require specific mortgage products, so the first step in to consult your lender to see what their process is for changing product. It will certainly require a revaluation of the property for a surveyor to confirm the achievable room rental rate and is likely to incur other fees. Most insurers do not provide cover for HMOs, so you may need to change provider and be prepared for an increased premium. The current tenancy. You will need to give your current tenants notice and be prepared in case they refuse to leave and eviction becomes necessary. Increased regulation. HMOs are subject to tighter health and safety regulations than single lets, so it’s vital you consult both the local council and fire service to ensure you know what need to be put in place to ensure a legal let, including electrical checks and the fitting of fire doors. Furnishing. HMOs are almost exclusively offered furnished and fully kitted out with kitchen appliances, crockery, glassware, etc., right down to a vacuum cleaner, iron and ironing board. There are companies that specialise in providing furnishing packages for HMOs, which can prove cost-effective and save you a lot of time. Your mortgage payments are likely to be your biggest monthly outgoing, particularly if you have a high loan to value, so this is where you could potentially make significant savings. New products and initially discounted deals are coming to the market all the time, so it’s a good idea to consult a broker every year or so, to make sure product you have is still competitive and check for any more suitable ones. If you don’t already have a broker or would like to compare the products you’ve been offered, our consultants will be happy to help, with a free initial consultation. Our initial mortgage consultation is free. We will charge a fee between £399 and £999 that is payable on application. The amount we will charge is dependent on the amount of research and administration required. We reserve the right to charge a subsequent fee of £99 for each further application that may be required. Depending on the extent of the changes you make, it could mean slightly more rent within your existing target market, or you might be able to appeal to a different type of tenant and command significantly more rent, for example, carrying out a full refurbishment and moving into the professional/corporate market or converting the property into an HMO and achieving far better returns with an all-in rent. Even if you can only afford to make little changes, remember that it’s not all about the month-on-month rental return. The better and more comprehensive the services you can offer, the longer your tenants are likely to stay and the less likely it is that you will suffer void periods. And all of that will boost your yield.